As director of Breast Imaging at Mayo Clinic in Florida, Michelle McDonough, M.D., is no stranger to mammograms. So when she looked at her own mammogram back in March 2006, she knew exactly what she was looking for. And, more importantly, she knew how to interpret what she'd found. Abnormal calcifications in her breast that told her that she had the "very earliest" stages of breast cancer. After a bilateral mastectomy to remove the cancer, Dr. McDonough is cancer-free today and continuing to help patients detect and deal with abnormalities in their own mammograms. And she's now able to do all of that faster and more accurately thanks to some shiny new imaging technology. Florida's First Coast News reports that Mayo Clinic in Florida is the "first in the state" to offer patients "tomosynthesis guided biopsies." Basically, this new technology allows doctors at Mayo Clinic in Florida to get a "3-D view" of a patient's breast by taking multiple images and combining them to create a realistic 3-D image. These new, higher-quality 3-D images are making it easier and quicker for physicians like Dr. McDonough to examine and detect abnormalities. "It means we can get the patients in and out," Dr. McDonough tells First Coast News of the new imaging machines. "They're less uncomfortable. They don't have to be compressed as long." But perhaps the most important thing Dr. McDonough tells First Coast News is that she's hoping the new technology can help reduce the occurrence and severity of breast cancer altogether by catching it sooner. Because, she says, "no one wants to go through" breast cancer. "But if you do the right things and you take care of yourself, everything could turn out good," she says. And that all starts with regular mammograms. Because, when it comes to detecting and treating cancer, as First Coast News aptly concludes in its report: "Every image, and every minute, counts." 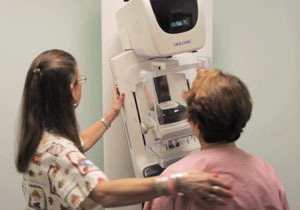 For more information on breast cancer diagnosis and treatment and Mayo Clinic, click here. You can watch the full report here. Then, be sure to come back here to share your thoughts below.